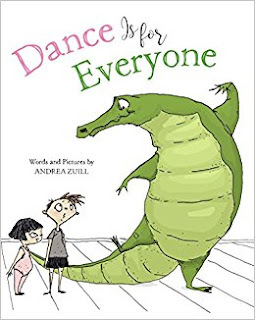 When the new student at Mrs Iraina's dance class turns out to be a 450-pound alligator, the other students are a little surprised. They decide to roll with it, but prepare well with a large bag of alligator food and a book on living with alligators. They name the alligator Tanya, after the great prima ballerina Madame Tanya Prefontaine (apparently, there's a resemblance) and she seems happy. There are a few hiccups with the new student but the class devises a special concert to showcase Tanya's talents and make her feel part of the class. Not only that, the students give Tanya the starring role and happily take on the other parts of duck, turtle, frog and raccoon in 'The Legend of the Swamp Queen'. Everything about this book is utterly charming, from the children's initial sideways glances at Tanya to their overwhelming joy as she becomes part of their class. The beauty of children and their ability to accept others without question shines through with sweetness and humour. The illustrations are a perfect blend of black ink and pops of vibrant colour. The wonderful feeling of movement and the expressive faces and gestures are the perfect match for the comical text. Themes of diversity, acceptance and inclusion are delivered in a subtle and playful manner, making this a book for everyone.